Martin Allen has confirmed new signing Kyel Reid will be available for selection when Chesterfield travel to Salford City on Saturday. The Spireites boss snapped up the experienced Reid on Thursday afternoon and spoke in glowing terms of the club’s hierarchy in allowing the deal to go through. Winger Reid, 30, has more than 300 Football League appearances to his name and a long list of previous clubs including Barnsley, Sheffield United and Bradford. And Allen was delighted to have him in his squad in time for Saturday’s test at The Peninsula Stadium. “He’s a good player. We are a little bit short and fair play to my bosses, they’ve come up with a contract and allowed us to do it,” said Allen. Chesterfield will dust themselves down from Tuesday night’s defeat - their first of the season - at Barrow, which brought to end a perfect start to the campaign. But Allen said there was no time to dwell on the loss. The Spireites’ opponents on Saturday meanwhile picked up their first National League win on Tuesday at home to early pace setters FC Halifax Town. Summer signing Adam Rooney bagged a brace for Salford as Graham Alexander’s men secured a 2-1 win on the night in front of a crowd of 2,632. There is expected to be even more packed into the Peninsula on Saturday after the Spireites sold out their 1,300 ticket allocation for the highly-anticipated encounter. Salford, though new to the division, were among the pre-season favourites to clinch the National League title after three promotions in four years under the ownership of Manchester United’s Class of ‘92. Expectations were cemented after the signings of striker Rooney from Scottish Premiership side Aberdeen and attacking midfielder Danny Lloyd from Peterborough United of League One. 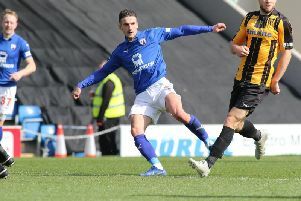 Alexander’s side have two ex-Spireites in their ranks in Scott Wiseman, who signed following his summer release from the Proact, and Mani Dieseruvwe, who began his career at Sheffield Wednesday.